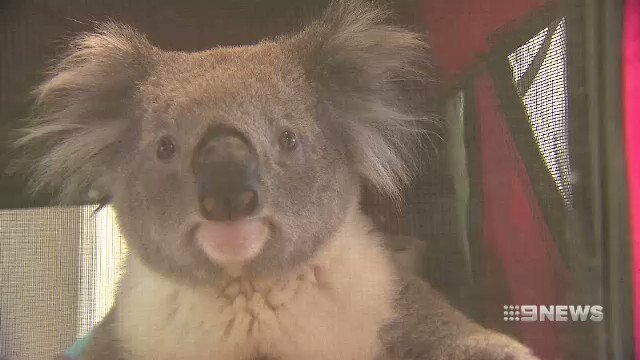 Ernie the four-year-old koala is now on the mend after he was transferred to us from Werribee Open Range Zoo. Ernie required repairs to his knee after being hit by a car near Portland last year, fracturing his femur bone. The complications in his injury required specialist treatment from U-Vet Werribee Animal Hospital in which two screws were placed in his knee joint. Among our lucky team of vets to treat him were Dr Stewart Ryan, Head of Small Animal Surgery, and anaesthetist Dr Jen Carter. "We had to do a repair where we placed the pieces back together and used two screws to hold it in place," Dr Stewart Ryan said. The Australian icon came back for a check-up and despite a limp when he walks, he is recovering well. Dr Jen Carter commented, "He was wide awake, we got to hear some noises he makes, great grunting sounds." For further information, read about our Small Animal Surgery services or contact us. Read the full story on Nine News.